Since the time PM Narendra Modi took the charge of office in 2014, he is working tirelessly for the country. We have seen this that he is quite active in meeting his counterparts. He has made several foreign trips since beginning. In fact, opposition and even the common man raise questions over his frequent foreign visits. They ask for the motives behind these trips. To clarify all the doubts, check out the following. Narendra Modi joined the office on 26 May, 2014. Since then, PM has made 41 official tours. His first official two-day trip was to Bhutan on June 15, 2014. He lastly visited China on 9th and 10th of June 2018. 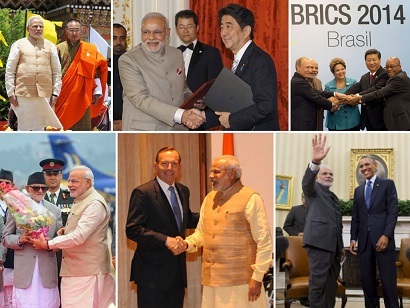 Talking about PM Modi, he has made India earn respect and honour at international level. He held meets with several leaders across globe and attended conferences. He gets linked India’s economic interests with diplomacy. He made India positioned as global investment destination by allowing FDI to enter India. He tactfully mobilized resources for his development programs. In fact, PM brought bullet train technology to India from Japan. Another achievement is bringing 5 years uranium supply for Indian nuclear projects. From Turkmenistan, he brought a contract to bring natural gas to India. It is great achievement that India got Chabahar port contract from Iran and thus created a new trade route bypassing Pakistan. He got huge investment for military drones for surgical attacks. He made a trip to countries like Israel, Mongolia and Palestine and became the first Indian PM to do so. He also visited several countries like UK, Nepal, Spain, Australia, Sri Lanka, Fiji, Mauritius, Sychelles, UAE, Ireland and Canada which were visited by any Indian PM from at least a decade. These visits opened the path to trade and business with these nations. With his efforts, India’s FDI inflows have increased tremenduously. He also strengthened his relations with international superpowers as well as neighbor countries.